The latest issue of kids' mag CoroCoro shows what the three new Pokémon for the upcoming Pocket Monsters: Black and White look like. The magazine does note that as with previous generation of Pocket Monsters the "type" is important. 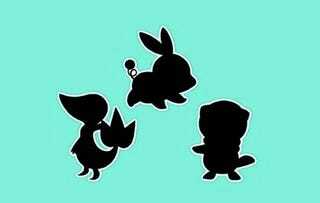 According to website PokéBeach, the game's region is Isshu, and the names of the 3 new Pocket Monsters seem to be Tsutaaja, Pokabu, and Mijumaru. The magazine also states that the Pokémon trainers are more grown-up than previous trainers.